Love this watch! It is exactly what I wanted! Simple yet sophisticated, the classic Jacqueline women's timepiece features bold Roman numeral markers on a suave silvertone dial. Run with Japanese quartz movement, this elegant watch is held in place with a stunning silvertone bracelet. The classy timepiece is well suited for every day use and even water resistant up to 99 feet. The clasp band makes it easy to wear the watch or take it off. The push and pull crown makes setting the time a snap, while you can find the date tracked at the 6 o'clock mark. This is a very nice watch, thin to wear, It has a larger face , and the band is big enough to go around my larger wrist. I have a problem with the pin coming out and not keeping time. Now the pin comes out completely, I would not have expected such a nice watch to be of such poor quality. I,of course, have worn it and have gone over my 30 days so I cannot return it. Love this watch! Face perfect size ( I like larger faces) and love the bracelet band. Big fan of Fossil and always love the tins. Just as shown and described on site-- took awhile to arrive, but was ordered during the Christmas season- was worth waiting for. I am very satisfied with this watch. I had to have a local jeweler remove a few of the links to make it fit my small wrist. It is very simple but elegant. The face is large enough to see easily without squinting or seeming to be preoccupied around others. Super happy with it. Great everyday watch with large face that is easy to read! The first watch was broken, but Overstock quickly replaced it with a working one, and it is great. Customer service was very quick, and I didn't have to pay shipping on the returned watch. This watch is just right. It's got a slightly larger face, but is not bulky and large. Best of both worlds. Exactly as advertised. My teenager wanted something for everyday but nicer than a sports watch. This fits the need. This watch was exactly what I was looking for, for my daughter's birthday. She didn't want anything very dressy or "fancy", so this was the perfect choice. She loves it. Great purchase! Love this watch! It processed and arrived quickly! Looks a little different than picture, but still a great buy. A gift for a family member. 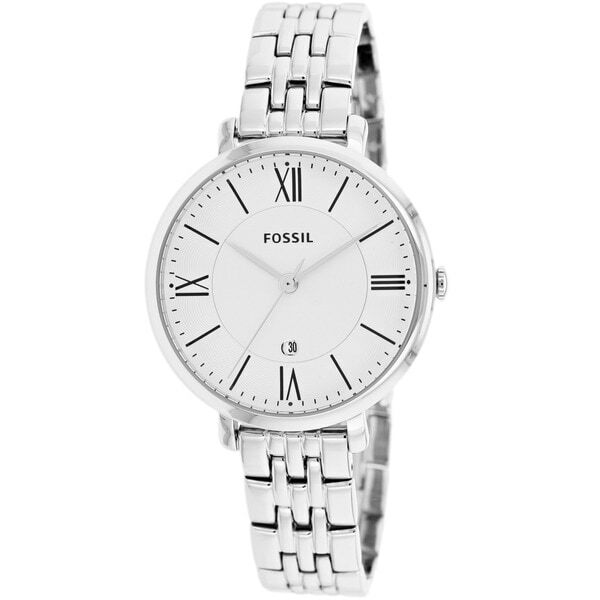 We have always wore Fossil Watches and this watch is simple yet nice and will also make a nice Christmas present. "Does this watch contain nickel?" Hello beth4889, thank you for your inquiry. Unfortunately, the information you have requested is currently unavailable. You will receive an email notification once an answer is posted. Have a great day.